The Daredevil of Hell's Kitchen kicks off the Netflix line of Marvel Select action figures! 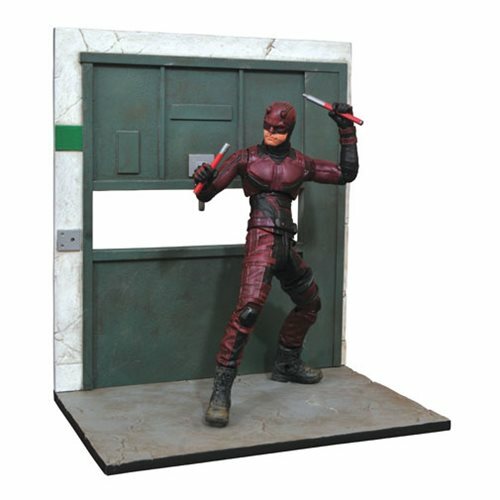 Capturing Daredevil's costume as it appears at the beginning of Season 2, and featuring the likeness of actor Charlie Cox, this 7-inch action figure features approximately 16 points of articulation and a pair of billy clubs, as well as a sculpted diorama base depicting the elevator from the season premiere! The Marvel Select Netflix Daredevil Action Figure comes packaged in the display-ready Select packaging with side-panel artwork. Ages 8 and up. The Devil of Hell’s Kitchen Is Waiting for You!